Photo by gbalogh from the Torontoist Flickr Pool. When it comes to cool, it’s hard to top Queen St. West. It seems like every kid with a safety pin stuck through an eyebrow is making the scene there, maybe hovering outside the CHUM-City building and wishing they were inside at the MuchMusic dance party. Some commentary on the rest of the column after the fold. Wow, everything from a Reg Hartt poster to another Reg Hartt poster. 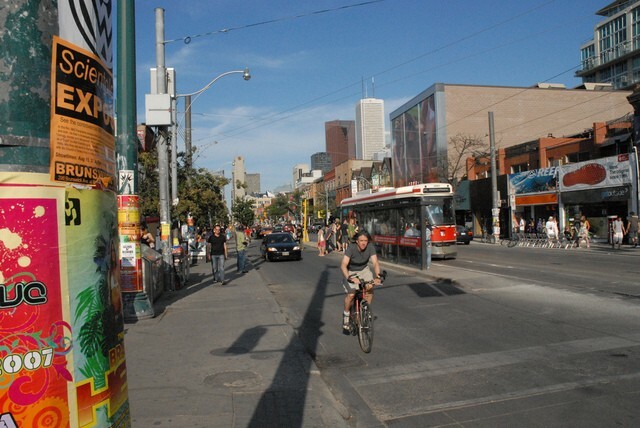 Unauthorized postering is illegal in Toronto, but until the city puts up new “postering kiosks” – which are a component of the new, GTA-harmonized postering bylaw passed last year – the rules are not being enforced, says Kyp Perikleous, who’s in charge of the street furniture division. Although there are restrictions, postering on utility poles is legal in the former City of Toronto. The Council of the current City of Toronto approved a new bylaw [PDF] governing posters in July of last year [PDF], but it is not in effect, as it attempts to create a distinction between “commercial” and “community” posters, restricting the former to “postering kiosks” and allowing the latter to remain on utility poles, with certain conditions; as there currently are only a handful of postering kiosks in the city (at U of T and in Little Italy, for example), commercial posterers would be able to successfully sue the City for violating their free speech rights if the bylaw were currently on the books. Once the new Astral Media kiosks come in as part of the street furniture plan, the City Solicitor will take the final steps to add the new bylaw to Toronto’s Municipal Code [PDF]. There is also no “GTA-harmonized postering bylaw,” as the Toronto Environmental Alliance was harshly reminded when their Smog Hike crossed Steeles. Such a law would make no sense and really couldn’t even exist, given that there is no single regional government for the entire GTA; the province, in theory, could pass such legislation, but then it would be a law, not a bylaw. The new postering bylaw is one that “harmonizes” the relevant bylaws of the six former municipalities that now form Toronto. Supply and delivery of the kiosks is part of a larger package of needs that is working its way through the city bureaucracy, said Perikleous. Expect the components with advertising to hit the streets first. The bylaw can’t be enforced until the kiosks are finally in place, sometime in the new year, he said, adding the city still removes posters from utility poles and public walls, but has a hard time keeping up with the mess. That’s small comfort for streetcar operators and passengers. The current bylaw prohibits postering on top of “any public signage,” meaning that there’s no reason the City can’t strip the posters covering the TTC stops and fine the offenders a “per-poster removal fee” on top of other penalties. After all, when it comes to “scenesters” these days, there’s no hotter brand than the TTC.